The role of airports – and more generally of the aviation sector – in the UK Government’s deportation practices was exposed in December 2018 after a group of activists locked themselves around a plane that was carrying deportees to Nigeria, Ghana and Sierra Leone from London Stansted. The 15 protesters, which became known as the Stansted 15, went as far as breaking a perimeter fence to prevent the plane from taking off. They were later arrested for disrupting services and endangering operations. The Stansted 15’s actions not only exposed the controversial practice of deporting asylum seekers to unsafe countries, but also put the aviation industry under pressure, urging it to stop collaborating with the government on this matter. Thousands of staff members of the US’s Transportation Security Administration (TSA) took to airports across the country to complain against the government shutdown that stranded the US from December 2018 to January 2019. During this period of political uncertainty, TSA employees staged protests in key American hubs including Seattle, Sacramento, Pittsburgh and Kansas City after missing two consecutive pay checks. As the shutdown unfolded, causing disruption and chaos at several US airports and federal agencies, passengers got involved in the protests and supported the striking TSA staff. Human rights advocates around the world pointed their fingers against the new Istanbul Airport in September 2018 as it emerged its construction was carried amid unsafe working conditions. With operations set to kick off in March this year, Istanbul’s new airport is preparing to accommodate over 90 million passengers a year. However, a number of reports showing poor health and safety conditions at the hub led to a series of strikes and unrest from its employees that lasted a few months. Engineers and staff working to build Istanbul’s second airport took to the streets in September 2018 to protest against poor safety, working and sanitary conditions. In particular, two separate waves of discontent shook the Turkish city; the first one came in September 2018 after a number of reports exposed the prison-like conditions in which construction engineers were forced to work while building the new airport. The second one followed the imprisonment of a number of protestors and took place at their official hearing in December 2018. Airports are often at the centre of environment-related dissent as the aviation sector is responsible for 2% of global greenhouse gas emissions. In the case of Bristol Airport however, activists took their protests to the next level. In January this year, tens of campaigners staged a die-in protest meant to raise awareness about the hub’s expansion plans, which risk producing immeasurable damage to the area’s air quality, as well as its surrounding natural spaces. The initiative involved politicians and members of the public. Airport bosses announced ambitions to expand Bristol Airport, making it capable of accommodating up to twelve million passengers a year by 2025. Thousands of American people took to their local airports in January 2017 to express their dissent against President Donald Trump’s controversial immigration ban, which prevented legal immigrants from seven mostly Muslim countries from returning to the US amid terrorism fears. 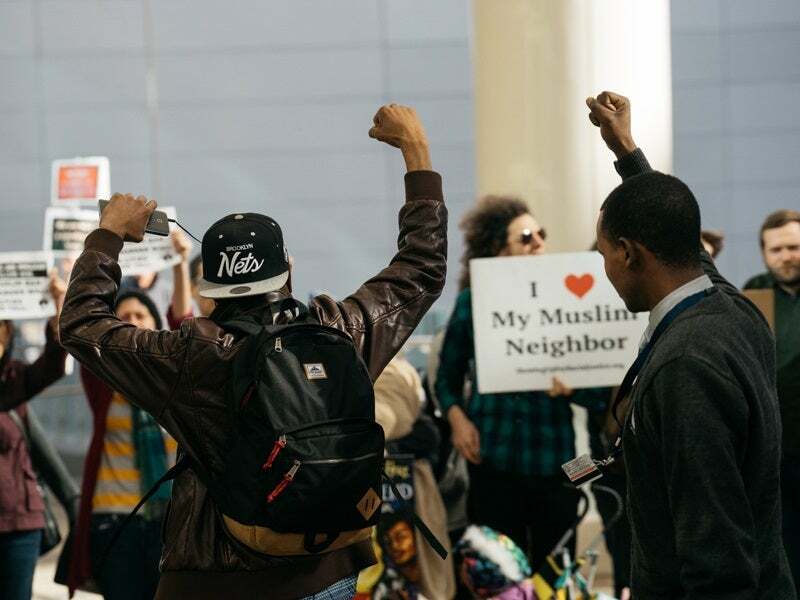 With many immigrants being detained at border checks, major airports in the country including New York’s JFK, Washington’s Dulles Airport, LAX and Chicago O’Hare became the natural place to stage protests. For example, 3,000 people gathered at Seattle’s Tacoma airport urging for the release of 13 people who had been detained. Meanwhile, in Boston, the crowd of protesters was joined by several political figures such as Mayor Marty Walsh and Massachusetts Senator Elizabeth Warren.